This series, Pitchers and Stomach Aches, is based on my new feature on Philliesnation.com, Decade's Worst Individual Pitching Performaces, otherwise know as DWIPP. 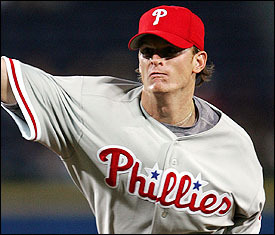 Gavin Floyd: Drafted fourth overall in the 2001 draft, Floyd was the Phillies highest ranked prospect, but never lived up to his expectations. In 2005, he had a 10.04 ERA and 1.77 WHIP and in 2006 a 7.29 ERA and 1.88 WHIP. I got to watch batting practice this afternoon! I also got you an official 125th Anniversary International League ball from BP (they use last year's game balls for BP now).